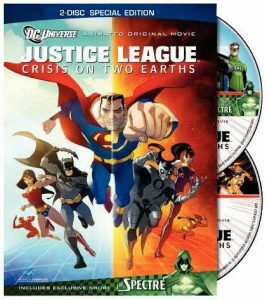 The animated movie Justice League —  Crisis on Two Earths uses the idea of alternate universes — what if someone else had become Batman, or if young Clark Kent were raised by mobsters instead of the Kents? The idea has been used for many years in the comics, and Crisis on Two Earths uses that setting to tell a very interesting story, with the best kind of ‘adult’ storytelling. Everyone remains clothed, but ideas are explored, worldviews are challenged. Ending with a debate/fight between the heroic Batman and his evil counterpart, Owlman, over Nihilism — seriously. Crisis on Two Earths begins with Lex Luthor in a power suit, accompanied by the Joker in a Jester’s costume. They break into a high-security area and steal a ‘quantum trigger’. Alarms going off, the pair tries to escape from … the Justice League? The Jester sacrifices himself to buy Luthor the time to escape, and is killed by what appears to be Hawkgirl (using a flaming sword) and (in the first of many nods to other characters and fiction) what appears to be J’onn J’onnz the Martian Manhunter — looking like one of the Green Martians from Edgar Rice Burroughs’ Barsoom novels. The dying Jester gets his revenge on his murderers by detonating an explosive, killing them all. Luthor is soon confronted by the rest of the Justice League. Except that they’re not the Justice League that the audience knows. They wear different costumes and are different people. 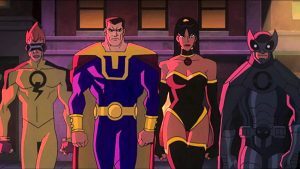 They’re a villainous version of the League known as the Crime Syndicate, whom Luthor escapes from by leaving their dimension and travelling to the dimension that the viewers are more familiar with, populated by the Justice League — and asking for their help in freeing his world from the villainous Crime Syndicate. This heroic Luthor ( ‘call me Lex’ ), with the aid of the Justice League, starts attacking the Crime Syndicate’s various operations, fighting alternate versions of many of the various DC Universe characters — Green Arrow, Black Canary, Captain Marvel, etc. But even after they win, including arresting the leader of the Crime Syndicate, Ultraman, all is not well. I thoroughly enjoyed Crisis on Two Earths and recommend it highly.